From the SRB swimming team, within the morning heats, in the women's 400 Individual Medley, Anja Crevar ranked 26th of 35 participants with the time of 4:50.04 (entered time 4:46.13). 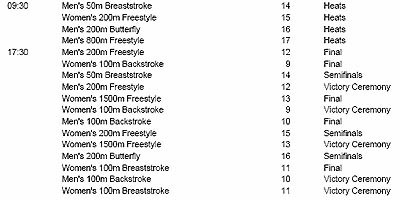 (Kazan, RUS) - Withing the morning heats on the Day-7 of the FINA World Champs Kazan 2015, five new disciplines were on the program: W 50 fre, M 50 back, W 50 breast, Mix Relay 4x100 free and M 1500 free. Within the evening finals, two new World Records were set: Katie Ledecky USA in the W 800 free final (8.07.39) and the USA team in the Mix 4x100 free relay (3:23.05). 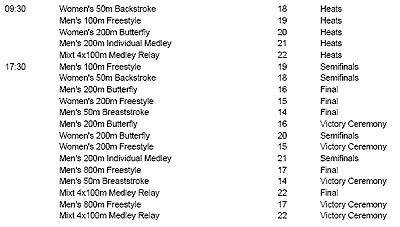 New word champions became: in the W 50 fly Sarah Sjostrom SWE (24.96 CR); in the M 50 free, Florent Manaudou FRA (21.19); in the W 200 breast Emily Seebhom AUS (2:05.81) and in the M 100 fly Chad LeClos RSA (50.56). From the SRB swimming team, within the morning heats, in the women's 50 free, Miroslava Najdanovski swum out the race in 25.89 (entered time 25.99) and earned 56th position (of 115 athletes). In the Mix Relay 4x100 free, SRB Team placed 16th (of 26 national selections) with the time of 3:38.66 (Barna 51.21, Nikolic 50.24, Najdanovski 57.98, Crevar 59.23). In the men's 1500 free, Vukc Celic placed 33rd (of 45 participants) with the time of 15:33.71 (entered time 15:22.22). 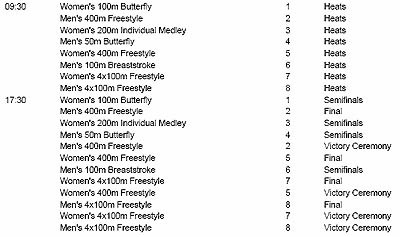 (Kazan, RUS) - Withing the morning heats on the Day-6 of the FINA World Champs Kazan 2015, six new disciplines were on the program. Within the evening finals, new world champions have become: in the M 200 back, Michaekk Larkin AUS (1:53.58); in the W 200 breast, Kanako Watanabe JPN (2:21.15), in the M 200 breast Marco Koch GER (2:07.76) and in the M 4x200 free, GBR Team (7:04.33). From the SRB team, within the morning heats, in the M 100 fly, Ivan Lendjer placed 31st of 73 competitors with the time of 53.04 (entered time 52.59), in the M 50 free Boris Stojanovic finished as 31st of 115 athletes in 22.81 (entered time 22.70), while among 22 teams in the M 4x200 free relay, SRB Team ranked 18th with the time of 7:20.29 (Sorak 1:50.67, Stjepanovic 1:46.08, Nikolic 1:51.87, Celic 1:51.67). 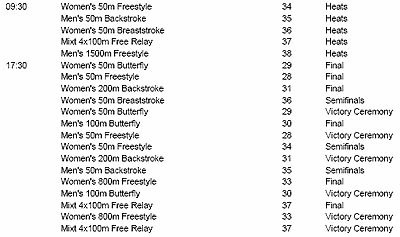 (Kazan, RUS) - Withing the morning heats on the Day-5 of the FINA World Champs Kazan 2015, five new disciplines were on the program: W 100 free, M 200 back, W 200 breast M 200 breast and W 4x200 free relay... The new WRs omited today. New world champions became: in the M 200 IM, Ryan Lochte USA (1:55.81); in the M 100 free Zetao Ning CHN (47.84; in the W 200 fly Natsumi Hossi JPN (2:05.56; in the W 50 back Yuanhui Fu CHN (27.11) and in the W 4x 200 free, USA Team (7:45.37). 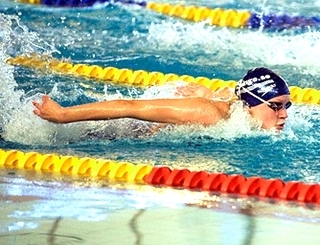 From the SRB swimming team, within the morning qualification, extremely poor performances could be seen. In the W 100 free, among 90 athletes, Miroslava Najdanovski placed 47th with the time of 57.34 (entered time 56.37). In the M 200 back Vuk Celic ranked 33rd with the time of 2:05.54 (entered time 2:02.13). In the W 200 breast, among 50 participants, Jovana Bogdanovic concluded at the 40th position with the time of 2:35.88 (entered time 2:32.09)..
From the SRB swim team, Caba Siladji went great twice in the M 50 breast. 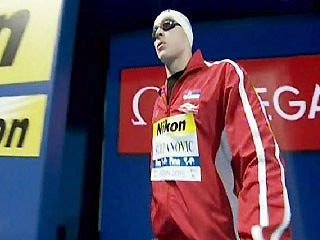 In the mornimg heats among 78 competitors he ranked 6th with the time of 27.19. Also in the morning heats Vuk Celic in the M 800 free placed 29th with the time of 8:05.68. Withing the evening semi-finals Caba Siladji in the M 50 breast confirmed his the world top-7 position with the same time 27.19. Tomorrow Siladji will start the final race from the lane 1. Congratulations !!! 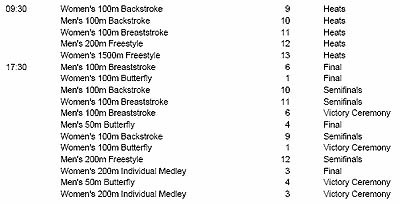 (Kazan, RUS) - Day-2 of the 16th FINA World Swimming Championshoips confirmed that the highest performances would be seen almost every day of the competition. 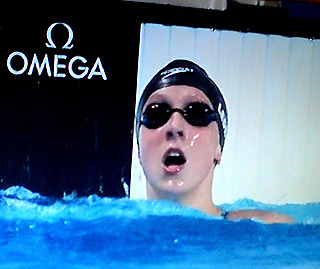 Within the morning qualifications, Katie Ledecky (USA) set the new WR in the W 1500 free (15:27.71). In the evening semis and finals Katinka Hosszu (HUN) in the W 200 IM final, swum out better then the previous WR (2:06.12). Also Sarah Sjostrom (SWE) in the W 100 fly final (55.64) confirmed the world power. New world champions have become Adam Peaty (GBR) in the M 100 breast final (58.12) and Florent Manaudou (FRA) in the M 50 fly final (22.97). 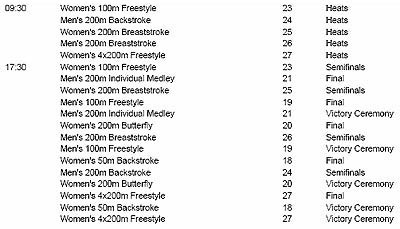 From the SRB swim team, Velimir Stjepanovic, within the morning heats in the M 200 free placed 11th with the time of 1:47.10 (in front of Chad LeClos and Ryan Lochte) and earned SFs. Petar Petrovic, in the M 100 back ranked 45th (57.44). In the evening semi finals, Velimir Stjepanovic (from the group 2, lane 7) did his best and finished with the time of 1:47.55 (positioned overall 12th). 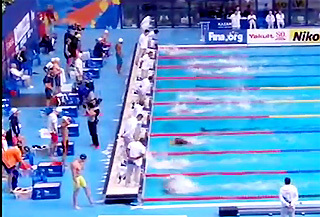 (Kazan, RUS) - The 16th FINA World Swimming Long Course Championshoips started Sunday in Kazan. Fantastic swimming could be seen just at the beginning. 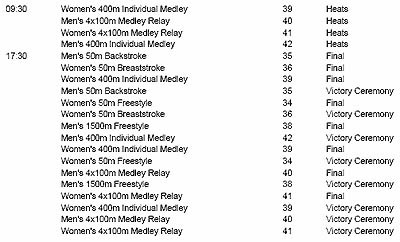 Also new records of the championships as well as the World and European standards have been set.. Overall, competitors from 183 countries are entered for the 8-day competition. Members of the Serbian Swimming team swum out the Day-1 races extremely poor. In the M 100 breast Caba Siladji within the morning heats placed 16th (1:00.35), while in the evening SFs confirmed the same position 16th with the time of 1:00.62 (entered time 59.79). 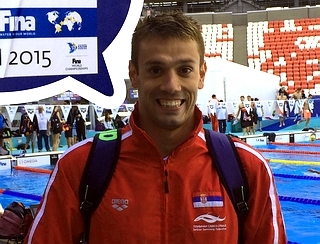 In the M 400 free heats Velimir Stjepanovic ranked 19th - 3:49.49 (entered time 3:45.66). In the W 200 IM Anja Crevar placed 35th (of 40 competitors) - 2:21.51 (entered time 2:17.14). In the M 50 fly Ivan Lendjer ranked 21/22nd - 23.87 (entered time 23.68). In the W 400 free Kat Simonovic placed 35th - 4:20.94 (entered time 4:20.09). In the M 4x100 free relay, SRB team (Lendjer 49.95, Nikolic 50.47, Barna 49.91, Stojanovic 50.88) placed 21st (3:21.21). 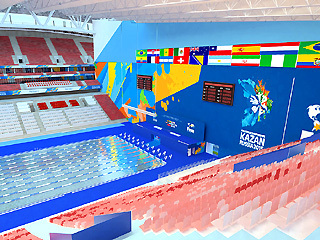 (Kazan, RUS) - The 16th edition of the FINA World Swimming Long Course Championshoip is centered around the marvelous Kazan Arena Stadium in the City of Kazan, Tatarstan Republic, Russia, a unique complex where the Myrha Pools has already installed the mobille competition pool. Place for spectators is prepared for more then 12,000 visitors and fans. The Olymp indoor swimming pool which is going to be held for the daily preparation of the national teams is situated in the Novo-Savinovsky District of Kazan. The official timekeeper Omegatiming has issued the List of entered participants. At the Omega official site. The full Start Lists can be found on Friday evening. This Special Web Blog will cover all achievements of the 13 Serbian swimmers as well as other top performances of other nations each day of the Championships. 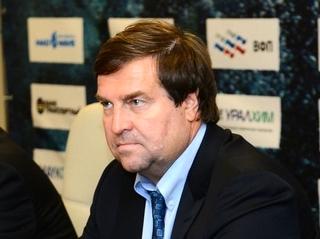 See bellow the official swimming program & schedule of the Kazan 2015 Worlds. 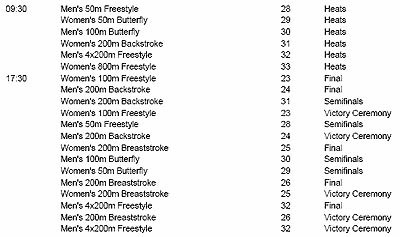 The final roster of the Serbian swimming team for the upcoming Fina World LC Swimming Championships Kazan 2015 that will be held in the capital of Tatarstan, Russia (from August 02-09) is allready presented to the audience. The National Team of Serbia for the Kazan will be consisted of the next participants: Velimir Stjepanovic (member of the SC Partizan, Belgrade), Ivan Lendjer (SC Proleter, Zrenjanin), Vuk Celic (SC Partizan, Belgrade), Miroslava Najdanovski (SC Novi Sad, Novi Sad), Boris Stojanovic (SC Kikinda, Kikinda ), Caba Siladji (SC Tamis, Pancevo), Petar Petrovic (SC Dinamo, Pancevo). Katarina Simonovic (SC Proleter, Zrenjanin), Stefan Sorak (SC Vojvodina, Novi Sad), Jovana Bogdanovic (SC Sparta, Pancevo), Uros Nikolic (SC Vojvodina, Novi Sad), Anja Crevar (SC Tamis, Pancevo), Andrej Barna (SC Spartak, Subotica) and Tamas Farkas (SC Novi Sad - competitor in the OWS events)... Go, Serbia !! !